I’ve made no secret of my love of halvah, and how Lilli, who seems to be vying to at least place at the picky toddler championship, loves to munch on it, too. 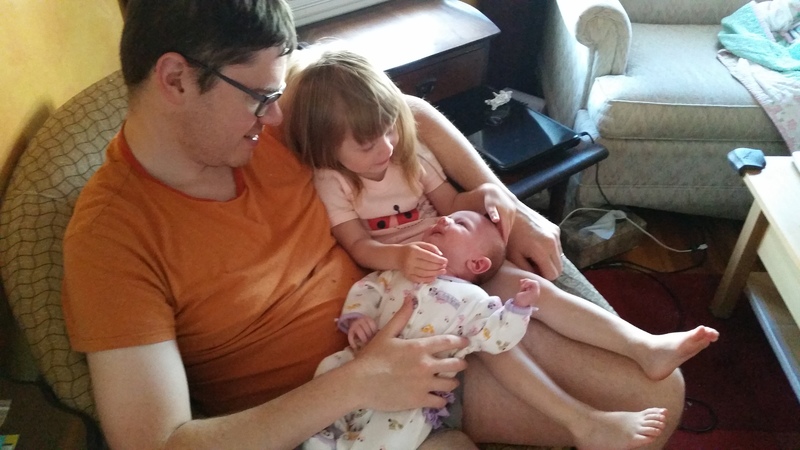 This is a known fact in my family, and so when everyone assembled for Beatrix’s baby naming, I found myself with a curious problem: a surplus of halvah. So Lilli and I grabbed our aprons — or kitchen smocks, as she calls them — and got to work on the ice cream. The cake will have to wait because it’s too darn hot to turn the oven to 400F. The result was excellent if you’re into halvah and ice cream — so, pretty much everyone. This is a traditional custard-based ice cream, with heated eggs, making it safe for pregnant women. You drizzle in tahini, then add halvah at the very end of the churn. I’m including the directions for those without an ice cream maker, but honestly, do what we did five years ago, and buy one off of Craig’s List for $25. This reminds me that I was sent a no-churn ice cream cookbook which I need to take for a spin. Will report back soon. Three small things: I couldn’t find my jar of vanilla beans, purchased for cheap in the gourmet food section at Home Goods, so I used a teaspoon of extract, as a classmate/baker once taught me to do. Two: I also didn’t have superfine sugar, so I made some by whirling regular white sugar in the food processor. Three: place the container you’re going to freeze the ice cream in before you get going, because Ottolenghi only mentions this as you finish up the churning. The full recipe is actually for halvah ice cream with chocolate sauce and roasted peanuts. Ottolenghi likens it to a “luxurious Snickers ice cream: sweet, nutty, and comforting. The chocolate can mask the halvah flavor a little, so better not drench it with sauce; just drizzle lightly.” Since the point here is halvah, we skipped the chocolate sauce – for now. Heat the cream, milk, and vanilla bean and seeds (or teaspoon vanilla) in a saucepan over medium heat until the mixture just comes to a boil. Remove from heat. In a bowl, whisk the egg yolks and sugar until combined. Use a ladle to spoon a little of the hot cream mixture into the egg mixture, whisking the whole time. Continue with more cream mixture until it is all incorporated. Return to the saucepan and place over medium heat. Stir with a wooden spoon continuously for 10 minutes, until the sauce thickens to a light custard consistency. 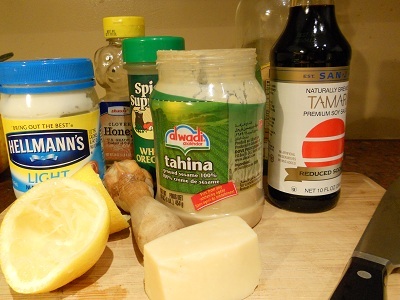 Remove from the heat and whisk in the tahini. Leave to cool for 20 minutes, then remove the vanilla bean pods if using. Pour the custard into an ice cream machine and churn for about 35 minutes, or according to the manufacturer’s instructions (for my machine it’s about 20 minutes) until semifrozen but creamy. Alternatively, transfer it to a freeze-proof container and place in the freezer for 4 to 5 hours, removing it every 30 to 45 minutes and beating it vigorously with a spatula or whisk to break up the frozen areas. Stir in the halvah halfway through freezing. Remove from the machine and stir in the halvah pieces. Place in a prefrozen container and freeze. Remove from the freezer 10 minutes before serving to let it soften. Make the chocolate sauce just before serving. Place the cream in a small saucepan over medium heat and bring to a gentle boil. Immediately pour this over the chocolate and stir until soft and uniform. Stir in the brandy. Divide the ice cream among bowls and drizzle some warm sauce over the top. Sprinkle with peanuts and sesame seeds and serve immediately. My father, who is originally from London and who now lives in Jerusalem, was once given advice on how to act more American: start drinking coffee instead of tea and watch the Celtics. Granted, this was 30 years ago, when I was little and the Big Three were Bird, McHale and Parish. Even though the coffee suggestion was a bit ludicrous, watching the Celtics seemed like sound advice, and I’ve been a Celtics fan my whole life. Sure, I’m sad the season is over, but if you told me in January that it would have lasted until the fourth quarter of Game 7 of the Eastern Conference Finals, well, I wouldn’t have believed it. I don’t think anyone believed in the Celtics more than Doc Rivers, and I’m so happy he knew we were all wrong. 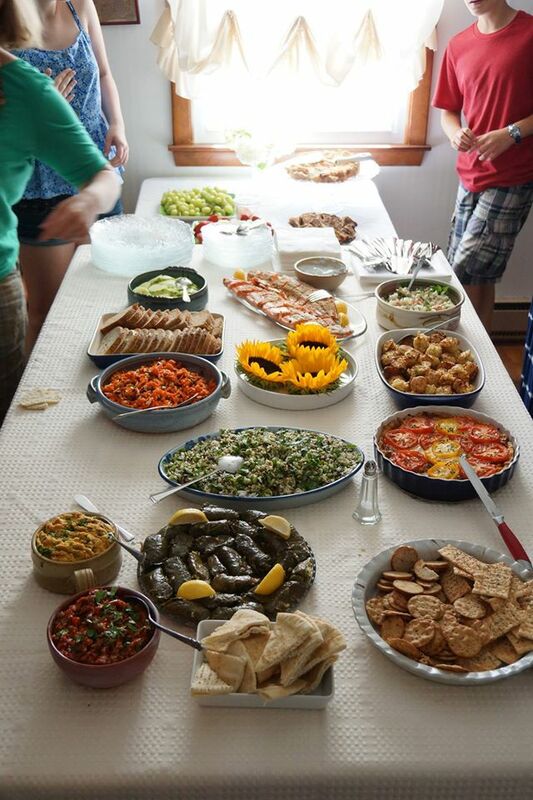 We hosted nearly every game in this post-season, and I always had something out for our guests to enjoy. Man cannot live on nachos alone, and truthfully, I’m much more likely to slap together a Mediterranean mezzes platter than to order a pizza. And so this eggplant dip found its way onto a platter last week. I wonder what Ottolenghi, an Israeli now living in London, would have to say about his eggplant dip being eaten with gusto in front of such a uniquely American sporting event, but I won’t wonder too long. There’s dip to eat, people! This might have been the easiest thing I’ve ever done to an eggplant. The day before, I placed it, whole, on a foil-coated pan, coated it with oil and roasted it for 3 hours, or until it turned mushy and caved in on itself. Once the foil had cooled off enough to handle, I folded it around the eggplant, dropped it in a bowl, and put that in the fridge overnight. 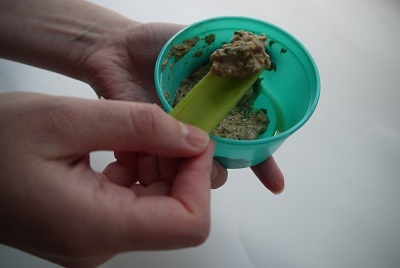 The next day, I scraped the meat from the blackened, blistered skin, and made this dip in less than seven minutes. Sure, our basketball season is over for now, but with about 17 hours of Euro 2012 on the DVR and the Olympics coming next month, I have no doubt this dip will be made again and again. First, burn the eggplant. (I was very lazy with mine and simply roasted the eggplant in a 400 degree oven for about 3 hours, keeping a close eye on it after the second hour.) Ottolenghi suggests (and I fully support) lining the area around the stove burners with foil to protect them, and starting the eggplants on the stovetop by putting the eggplant directly on two moderate flames and roasting for 12 to 15 minutes, turning frequently with metal tongs, until the flesh is soft and smoky and the skin is burnt all over. Keep an eye on them the whole time so they don’t catch fire. For an electric stove, pierce the eggplant with a sharp knife in a few places. 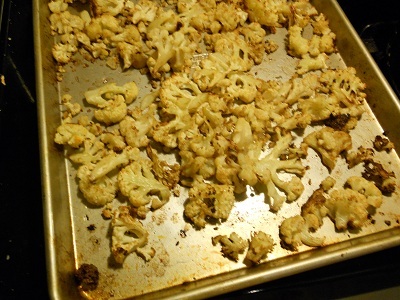 Put them foil-lined tray and place directly under a hot broiler for 1 hour, turning them a few times. The eggplants need to deflate completely and their skin should burn and break. When cool enough to handle, scoop out the flesh into a colander, avoiding blackened skin. Leave to drain for at least 30 minutes. Chop the eggplant flesh roughly and transfer to a medium mixing bowl. Add the tahini, water, pomegranate molasses, lemon juice, garlic, parsley and some salt and pepper; mix well with a whisk. Taste and adjust the season, adding more garlic, lemon juice or molasses if needed. You want the salad to have a robust sour/slightly sweet flavor. 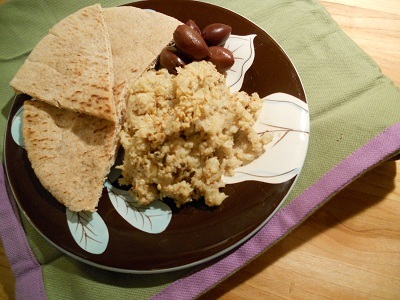 I served the eggplant with lots of cut up crunchy vegetables and triangles of whole wheat pita. Ottolenghi suggests sprinkling fresh pomegranate seeds on it and tossing it with sliced mini cucumbers and cherry tomatoes and making it more of a salad. It’s up to you, really. I’m a big proponent of the well-stocked pantry, but there is one staple that has until recently been banished from my larder: tamari. You see, tamari and I have a history. When I was in college, I went on a bit of a tamari bender. 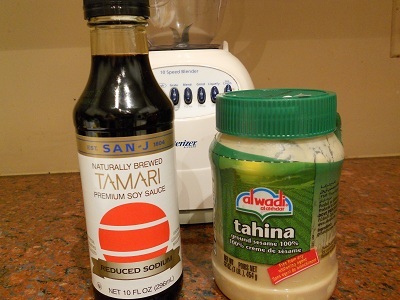 The darker, thicker, wheat-free cousin of soy sauce found its way into nearly everything I cooked. Back in the day I was a pretty strict vegetarian, and tamari is as flavorful as a piece of meat or hunk of cheese. It enhances the flavor of everything from rice to tofu to steamed vegetables. Tamari is umami incarnate: a concentrated blast of that “fifth taste” that makes meats and hard cheese so mouth-watering. It took an intervention from my friend, Ben, to get me off the sauce. After eating endless tamari-spiked dishes from my kitchen, Ben began to comment on the tamari addiction. Considering that Ben is finishing up a Psy.D. in counseling, I am glad I took his observations seriously. Under Ben’s watchful eye, I finished up my last bottle and went cold turkey. I haven’t had it in the house for about a decade. All that changed last week. How I came across this recipe is a fine example of social media. I am Facebook friends with my sister’s sister-in-law, Sarah, and a few weeks back, Sarah posted a question about purchasing some vegetables, and her friend, a perfect stranger to me, responded with this recipe. It looked good. So good, in fact, that I wrote on Sarah’s wall, to her friend, that I was going to steal the recipe. I did not mention the part about posting it to my blog, but her friend encouraged me to do so, telling me it was the best salad dressing. Ever. The secret? My old friend, tamari. So, judging myself a decade older and wiser, it was off the wagon and off to the market. And let me tell you, WOW, this dressing is fantastic. Rich hasn’t stopped eating salad all weekend long. I think I’ve counted him eating 7 separate servings of salad in a two-day period. Since I have never served Rich tamari before, he was blown away by the smooth, rich flavor of it. He could totally see why I had the addiction; low in calories and animal-free, tamari is pretty darn remarkable. Now I have a fresh bottle of it in the house, and I will work hard to make sure I don’t abuse it. This is a pantry recipe if I’ve ever seen one. You really should have everything here on hand at all times in the house. I’m not very particular about my tahini brands; I’ve tried maybe 3 or 4, and there’s no one that really jumped out at me or I didn’t like. Don’t be alarmed if you don’t have nutritional yeast on hand, most people don’t, but it’s good idea to have a hunk of parmesan hang out in the fridge to top off pastas, risottos or in this case, for dressings. You can whisk this altogether in a bowl, but I wanted the smoothness of a blender. Either will work. Whisk all ingredients in a bowl or blend together in a blender. I served this with some crunchy romaine and crisp discs of cucumbers and radishes, simply because that’s what I had on hand in the fridge. 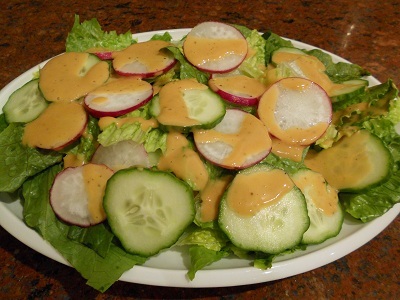 I have a feeling this dressing will work with just about any vegetable, but use a stronger lettuce than say, mesclun. For now, the leftover dressing is in a jar in the fridge. I’m not sure how long it stays, but I don’t think it’s going to be around for more than couple more days.